Monarda didyma is a tall, aromatic herb that grows along stream banks & ditches in its native North America. It can reach 2 to 4 feet in height, preferring moist soil & sun or light shade. It blooms from mid to late summer, producing flowers that resemble CRIMSON fireworks. The genus was named for the Spanish botanist Nicolás Monardes, who wrote a book in 1574 describing plants of the New World. Tea made from Monarda didyma is an aromatic aid to digestion, calming & relaxing. It is known as Oswego Tea in America & Canada; in France it is called Gold Melissa Tea. This is a plant which appears on gardening programmes with clouds of bees buzzing round its showy flowers. 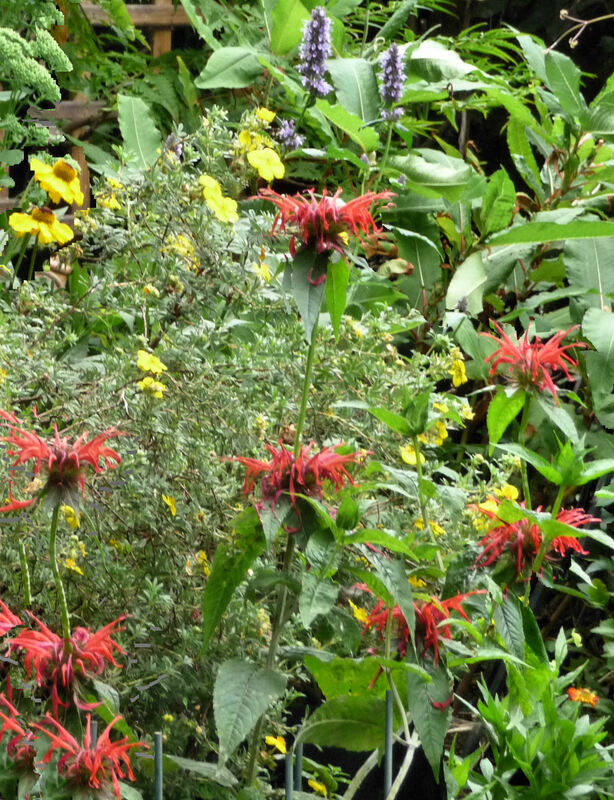 Other names: Bergamot, Crimson Beebalm, Horsemint & Scarlet Beebalm. “The Oswego Indians of western New York prepared an herbal tea from dried out fragrant Monarda didyma leaves. This was picked up by the early colonial settlers, who used these leaves as a substitute for imported tea, which was in short supply following the Boston Tea Party. 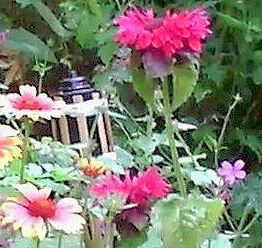 Our first Bee Balm, with its MAGENTA flowers, was a late addition to 2012’s garden. Brought back from the Hornsey Pet and Garden Shop in Crouch End, it was a casualty of winter in 2013. 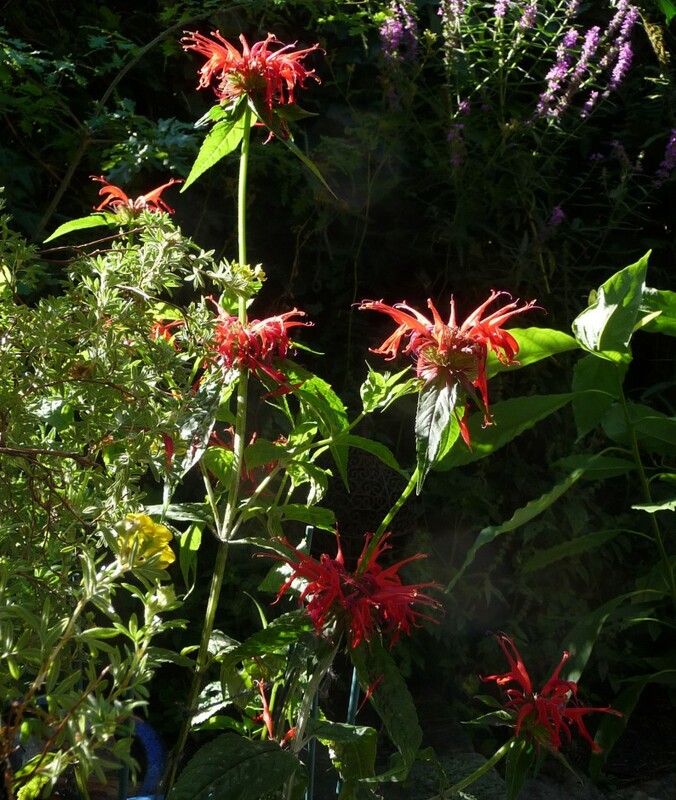 In 2015 we ordered a RED Monarda, ‘Squaw’ from Specialperennials in Cheshire. ‘Squaw’ arrived in the post, was planted up in a deep ceramic pot, & went on to provide a season of vivid CRIMSON RED flowers. But it had no visitors, no pollinators at all. We wondered whether the bee species who visit it had been affected by the long hard winter & wet spring. Perhaps ‘Squaw’ resented being planted in a container. We hoped that its second season would prove bee-friendly. February 2016 : Many small Monarda leaves cover the soil surface in the pot. All have holes from slugs or snails, not a problem if the new blooms flower as they did in 2015. September 2016 : In its second season, Monarda ‘Squaw’ grew to 3 feet in height & did indeed welcome the pollinators. Small snails carried on nibbling the leaves, till picked off & put on the birdtable. Bees, dangling from the red flowers, were unbothered. In 2017 the Monarda flowered beautifully, but bees were uninterested. Perhaps it needed more sunshine to produce its nectar & could do with its pot being shifted.. 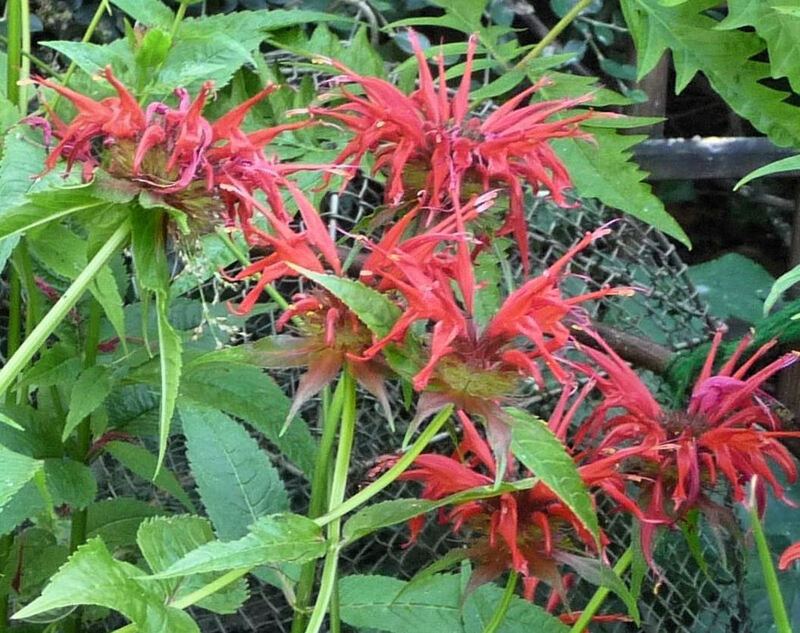 The RHS website says Monarda is prone to slug damage, & should not be allowed to dry out in summer or succumb to winter wet.